Saya suka cerita ini.sangat suka.Tisu yang bertimbun di atas meja menemani waktu saya menonton sebuah kisah ini yang sangat menyentuh naluri.sesiapa yang tidak punya perasaan di kala menonton cerita ini,memang dia patut masuk ke hospital bahagia! Sebuah kisah tentang seorang gadis yang menghidap penyakit tanpa boleh diubati. 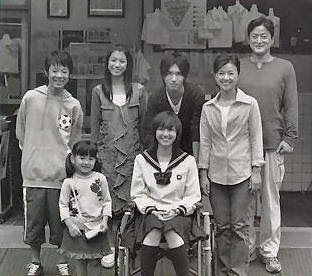 Aya Kito was diagnosed with a disease called Spinocerebellar ataxia when she was 15 years old. The disease causes the person to lose control over their body, but because the person can retain all mental ability the disease acts as a prison. Aya discovers this disastrous news as the disease has already developed. There is no cure. Through family, medical examinations and rehabilitations, and finally succumbing to the disease, Aya must cope with the disease and live on with life until her death at the age of 25. Its a true real story and dats about it.i love this story so much. it teach me such a meaningful lessons.and it motivate me a lot.I told all my frens how great this show is and hopefully someone like me will also learn something from her. I wanted to read the diary of Kitou Aya and went to search the Internet and thankfully to 2 devoted fans like me. They translated some parts of the diary(Japanese Version) and I was able to understand what the real Kitou Aya wrote in the diary.